Epson, a world leader in digital imaging and printing solutions has unveiled the Epson LQ-50 bill printer - the company latest and most compact serial impact dot matrix (SIDM) printer that is designed to help retailers produce high quality bills that impress customers in place of traditionally handwritten ones. This is especially important for industries where legibility is crucial - like the pharmaceutical trade where bills detailing batch codes and expiry dates must be clearly read and understood by customers. Designed in Japan with the Indian retail market specifically in mind the Epson LQ-50 is the culmination of 2 years of collaboration between the Epson India team and Epson Japan product development team. Noticing the lack of a suitable printer to cater to specific requirements of certain sectors in retail the LQ-50 was created after extensive research and field tests conducted in the market place. The Epson LQ-50 is at least thirty percent smaller than other Epson SIDM printers and is specifically designed for retail outlets where counter space is a premium. Another class-leading feature that makes the Epson LQ-50 extremely user-friendly is its ability to print up to 6-inch wide fanfold paper or 5-inch wide normal roll receipts for greater versatility in printing options. Keeping in mind India's diversity in languages the LQ-50 also comes equipped with 10 Indian languages in built. They are Assamese, Bengali, Devnagiri, Gujarati, Kannada, Malayalam, Oriya, Punjabi, Tamil, and Telegu In addition, the Epson LQ-50 has low running costs as its ribbons and paper media are highly affordable, thereby enabling retailers to save on overhead costs. At Epson, we conduct rigorous research to understand the unique needs in each market and are committed to providing the best solutions possible.says Samba Moorthy Senior General Manager, Sales & Marketing at Epson India. "In the Indian retail environment, we saw the definite requirement for compact dot matrix bill printers that are as flexible and versatile as the Epson LQ-50 for printing of large-sized and multiple-copy bills in pharmaceutical, F&B and retail outlets." Epson believes this new retail billing printer will help it further consolidate its Dot Matrix printer market share of 52% and its consequent leadership position in this market. 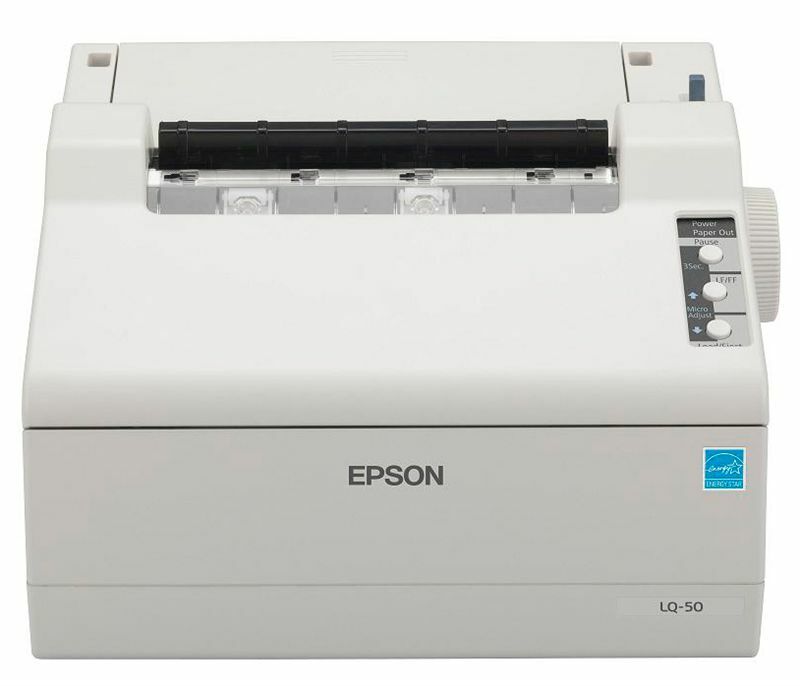 Large paper width format - Offering an option to print on almost twice the size of conventional receipt papers, the Epson LQ-50 dot matrix bill printer enables users to print up to 6-inch wide fanfold papers with a print area that is five inches wide, allowing users to clearly print transaction details in a neat format. Compact Design - The Epson LQ-50 measures 10.83 X 9.45 X 6.02 inches, weighs 3.3kg and is significantly smaller (30%) than other Epson SIDM printers. Its compact chassis allows it to be neatly placed in small retail counters, reducing clutter. Flexibility with Various Paper Formats - The Epson LQ-50 enables users to print on different paper types fanfold and roll media. It supports fanfold paper for printing on fixed forms or company letterhead. Moreover, an optional fan-fold paper holder can be installed to hold the paper neatly under the printer without creating clutter. Alternatively, roll paper can be used when the optional roll paper holder is attached to the printer this allows users to printing continuously without worrying about the length of the bill. High Print Quality with Script Support for 10 Official Indian Languages - The Epson LQ-50 features a 24-pin print head which supports printing of the script of 10 pre-installed official Indian languages in high resolution via the Microsoft Windows OS driver. Efficient Print Speed - To cater to fast paced retail environments, the bill printer can perform with outstanding print speed of up to 360 characters per second (cps) on high speed draft mode. High Durability - The Epson LQ-50 is a robust dot matrix bill printer with extremely high durability with a Mean Print Volume Between Failure (MVBF) rating of 20 million lines and Mean Time Between Failure (MTBF) rating of 10,000 power on hours (POH). This makes the printer very reliable for heavy duty usage, especially in retail environments. ENERGY STAR Certified - The Epson LQ-50 is ENERGY STAR certified for low energy consumption which helps users to save power and cost in the long run.